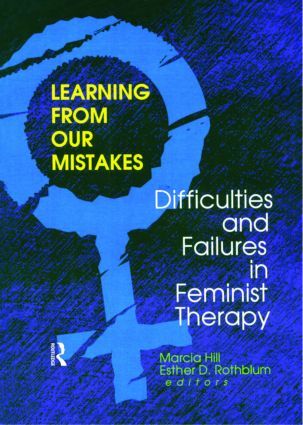 If you’re a long-time veteran of feminist therapy or someone just starting out, you’ll find a helpful, reliable list of “dos” and “don’ts” in Learning from Our Mistakes: Difficulties and Failures in Feminist Therapy. Frank and honest in tone, makeup, and style, this one-of-a-kind publication looks at the failures and roadblocks that have hampered feminist therapists in the past so you can learn from their misfortunes and avoid them in your own professional endeavors. It’s no mistake that Learning from Our Mistakes is full of what works and what doesn’t. In it, three veteran discussants give you the tools necessary to overcome the uncertainties and inadequacies that plague therapists. You’ll come away understanding the many ways failure is embedded in both the theory and practice of psychotherapy. Ultimately, you’ll find that mistakes are really only failure narratives waiting to be used, shaped, and turned toward the positive experiences of both client and therapist.